Congratulations to the newest Sir Knight, of Ann Arbor Commandery No. 13, Nate Hudson, and thank you to Ypsilanti Commandery No. 54 for another fantastic joint inspection. 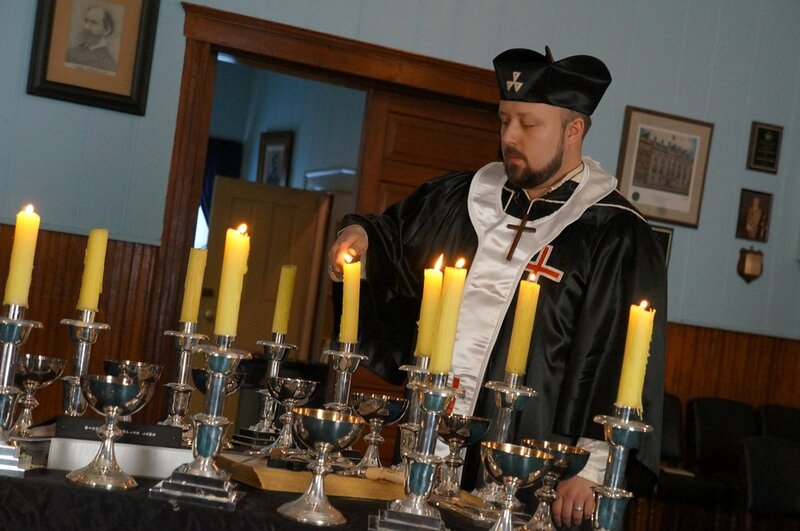 Congratulations to Chris Zervos on being made a Knight Templar in Ypsilanti Commandery No. 54. We were thrilled to take part. It is with much sorrow that we inform you that yesterday Brother, Companion and Sir Knight Rodney Deyo set aside the Working Tools Of Life and was welcomed into the Celestial Lodge and Asylum above. The arrangements for Brother, Companion, and Sir Knight Rodney Deyo can be found at https://www.vermeulenfh.com/obituaries/Rodney-Deyo/. We'll be putting together an honor guard for Sir Knight Rodney, please contact our Excellent Prelate, Brandon Mullins if you would like to participate. We'd like to congratulate Sir Knight Tom Jameson on being made Treasurer Emeritus of Ann Arbor Commandery No. 13, Knights Templar in recognition of his 43 years of service as Treasurer. Congratulations to our two newest Knights of Malta, Brandon Ion, and Nate Hudson. A big thank you to Detroit Commandery No. 1, Knights Templar for conferring such a fantastic Order of Malta on our candidates, among others this evening. A special thanks goes out to Detroit Commandery No. 1, Knights Templar for putting on such an amazing Illustrious Order of the Red Cross and allowing our candidates to participate. Pastor Mark began his pilgrimage to the Holy Land today and won't be returning until the 22nd. Keep Pastor Mark in your prayers during this journey. God, speed thee. Congratulations to Companions, William Green, and Nate Hudson on receiving their Cryptic degrees in Masonry yesterday. We thank Flint Council No. 56, R&SM, and the Grand Council of Royal and Select Masons of Michigan for hosting this conferral, and are proud to have these men in the Ann Arbor York Rite. We'd like to welcome our newest companions, Brandon Ion and Garry Lewis, and thank Wayne Chapter No. 182, Royal Arch Masons for hosting this wonderful Royal Arch Degree. The work was expertly performed by the members of Wayne Chapter, including our Most Excellent Grand High Priest, Rich Hitch, who presided over a conferral our members won't forget. The Steeds of Time course on. No flick of spurs. Nor curb of bits, can change their rhythmic stride. Turn not aside upon their cosmic ride. Nor whence they came, nor where their quest may lie. Since Chaos saw the Steeds of Time pass by. Ann Arbor Council No. 86, R&SM is proud to nominate Corey Curtiss, PTIM for the office of Captain of the Guard at the upcoming Grand Assembly of the Grand Council of Royal and Select Masons of Michigan. Congratulations to the 2017 officers of Ann Arbor Council No. 86, R&SM, and our new Thrice Illustrious Master Jake Foster. A great visit today from the Most Excellent Grand High Priest and his staff.